Jiji PressTOKYO (Jiji Press) — The Japan Aerospace Exploration Agency said Tuesday that astronaut Soichi Noguchi has been chosen as a crew member of a long-stay mission of about six months from around the end of 2019 in the International Space Station. For Noguchi, 52, it will be the third spaceflight, and the second long stay in the ISS following one from December 2009 to June 2010. At present, all astronauts on ISS missions use Russian Soyuz spacecraft. Depending on the timing of the completion of new spaceships under development by U.S. aerospace giant Boeing Co. and U.S. upstart Space Exploration Technologies Corp., or SpaceX, Noguchi may travel to the ISS aboard a new spaceship, JAXA said. Noguchi, from Yokohama, worked as an engineer at Ishikawajima-Harima Heavy Industries Co., the predecessor of heavy machinery maker IHI Corp. 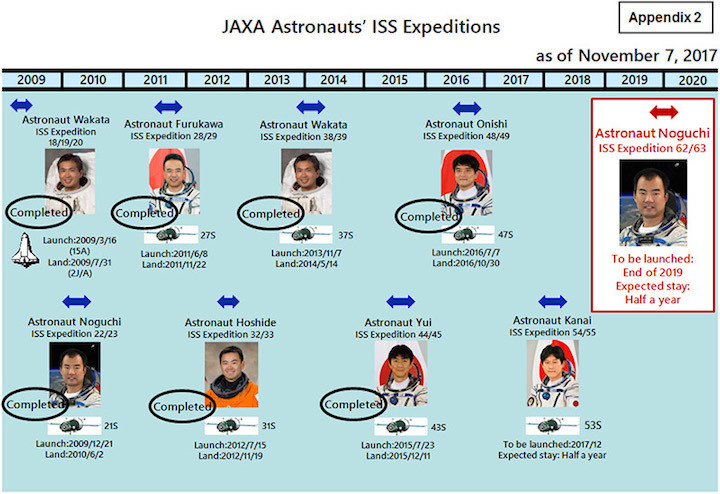 The Japan Aerospace Exploration Agency (JAXA), a national research and development agency, is delighted to announce today that JAXA astronaut Soichi Noguchi was selected as a crew member of the International Space Station (ISS) Expedition 62/63. The ISS Expedition 62/63 will be the third spaceflight for Astronaut Noguchi. He was launched as a mission specialist (MS) aboard the Space Shuttle for its Return to Flight mission in July 2005 after selected as a JAXA astronaut in 1996, and also worked on board the ISS for 161 days as a flight engineer of the ISS Expedition 22/23 after launched as the first Japanese left-seater for the Soyuz spacecraft in December 2009. 1965 Born in Yokohama, Kanagawa. April 1991 Joined Ishikawajima-Harima Heavy Industries Co., Ltd. (IHI), where he was involved in the aerodynamic design and performance testing of aircraft engines. May 1996 Selected as an astronaut candidate by the National Space Development Agency of Japan (NASDA, currently Japan Aerospace Exploration Agency) in May 1996 and joined NASDA. Participated in basic training for Russian manned space systems at the Gagarin Cosmonaut Training Center (GCTC) in Russia. He then continued MS advanced training at JSC while working on the Japanese Experiment Module (JEM) development tests. April 2001 Assigned as a crew member for the STS-114 (LF1) mission. July-August 2005 Flew on the STS-114 mission by the space shuttle Discovery was the Return to Flight mission. He conducted three Extravehicular Activities (EVAs) as a lead spacewalker (EV1) and became the first Japanese astronaut to perform EVAs on the ISS. During the spacewalks, he demonstrated in-flight repair techniques on shuttle's Thermal Protection System (TPS) tiles, replaced a failed Control Moment Gyro (CMG) with a new CMG, and installed External Stowage Platform-2 (ESP-2) on the ISS. He accumulated 20 hours and 5 minutes of spacewalk time in three EVAs. February 2007 Assigned as a back-up crew member for the ISS Expedition 18 mission. May 2008 Assigned as an ISS Expedition 20 crew member. December 2009-June 2010 As the first Japanese left-seater for the Soyuz spacecraft, he was launched to the ISS aboard the Soyuz TMA-17 (21S) from the Baikonur Cosmodrome in Kazakhstan. He spent 161 days aboard the ISS as a Flight Engineer for the Expedition 22/23 Mission. September 2014 Elected president of the Association of Space Explorers (ASE). September 2016 Removed president of ASE, and continues director of Asia region’s permanent director of ASE. It is my great pleasure to announce today that JAXA Astronaut Soichi Noguchi was selected to undertake a long-duration stay on the International Space Station (ISS). According to the current schedule for his approximate six-month stay on the ISS from the end of 2019, training for the 62nd/63rd Expedition Mission will begin at the end of this month. He will return to the ISS for the first time in nearly a decade, since his first spaceflight in 2005 where he contributed to the Space Shuttle’s Return to Flight mission and a second spaceflight involving operation support as flight engineer after being launched as the first Japanese astronaut aboard the Soyuz spacecraft in 2009. The decade sees a new environment that facilitates expanded and diversified forms of “Kibo” utilization, newly established by Astronauts Yui and Onishi, as well as the fruits now being harvested by Astronaut Kanai. 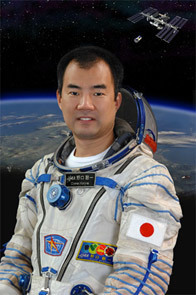 JAXA believes that Astronaut Noguichi’s rich experience and knowledge will help to further develop “Kibo” utilization being expanded by the new-generation astronauts toward industry and international cooperation in addition to science and technology, and thus bring greater benefits for society. We will strive to develop new technology and accumulate knowledge through the achievements made in manned space activities performed by Japanese astronauts during their continuous long-duration stays on the ISS, with a perspective on future space exploration programs based on international cooperation. Furthermore, we will seek to create results contributing to society, while enhancing the curiosity of the next-generation of young leaders in the field of science. And for Astronaut Noguchi’s selection, we would also like to express our sincere gratitude here for all the efforts made by the people concerned both inside and outside JAXA. It is a great honor for me to be selected as a crew member for the 62nd/63rd Expedition Mission to the International Space Station (ISS). I would like to express my sincere gratitude to the people concerned for all of your support. I appreciate this valuable opportunity given to me, which will mark my third spaceflight and under current circumstances where the new-generation of JAXA astronauts represented by Astronauts Yui, Onishi and Kanai, the latter with his upcoming flight to the ISS, are highly acclaimed for their singular activities. For the crew members’ round-trip to the ISS, the mission will employ the Russian Soyuz spacecraft or the new US manned spacecraft now being developed by a private company. This consequently requires me to complete the Soyuz spacecraft left-seater training as well as training for a new type of spacecraft that will become a leading player in future manned spaceflight. In addition to being greatly honored, I am also very humbled to be able to participate in a mission that will mark a commemorable turning point in the history of human spaceflight. In my mind, I have creative aspirations for always targeting higher goals and continuously facing and overcoming any difficulties, as in JAXA’s Action Declaration, and I will dedicate myself to the mission by making the most of my experience gained in the past two spaceflights that include contributing to the Space Shuttle’s Return to Flight mission and being aboard the Russian Soyuz spacecraft as the first JAXA astronaut. I will stay on the ISS in 2020, the year of the Tokyo Olympics and Paralympics Games. Much like Japan's athlete delegation, as a representative of Japan, I also look forward to delivering Japanese citizens a sense of pride and a positive impression by performing my tasks steadily in space. Finally, I would like to extend my sincere gratitude to all those who have long supported me directly or indirectly to date, and have sent me warmhearted greetings, and appreciate your continued support in the future.